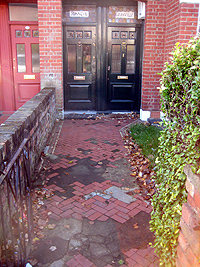 The front garden provided access to the two Red stock brick Warner style flats that occupy the site. 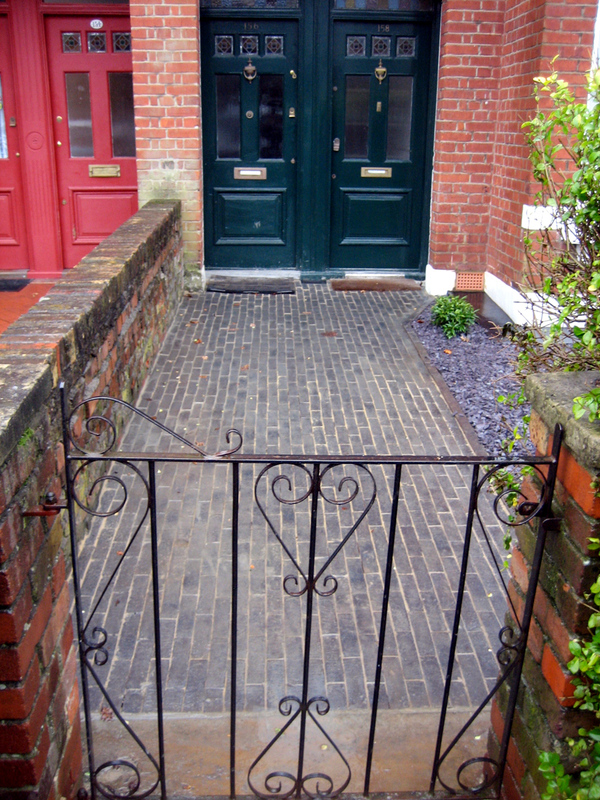 The original ornamental tile path was in an appalling state. There was a scruffy lawn and large privet hedge that the clients wanted to keep for privacy as it prevented people fork looking in from the street. 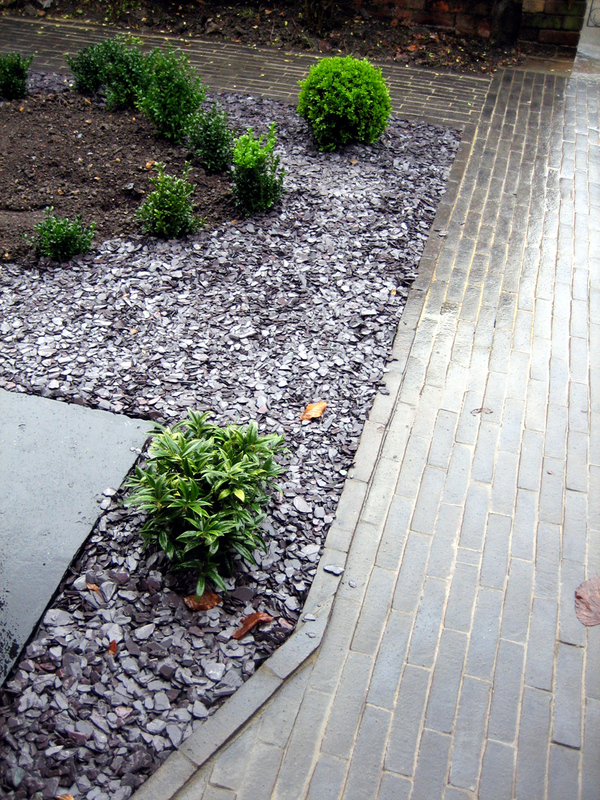 The clients wanted a neat and tidy front garden and to be rid of the lawn. The hedge was to be retained and access was required for a new bin store. A large storage unit was also required. Materials had to be complimentary to the building and a geometric style was preferred. Unfortunately there was not enough in the budget available to restore the original path, which would have been both the client's and my preference. It was felt that the path had to be complementary to the building but completely different to the original as we were to remove what was essentially the central feature of the garden. Therefore the path to the front doors and the new bin area was built using pavers form Van Moortel (used in by so and so at the Chelsea flower show in 2008). A large bike store was sited at the side of the garden and bolted to a concrete raft for security. A unit to screen the bin was included in the design but needed to be purchased at a later date. 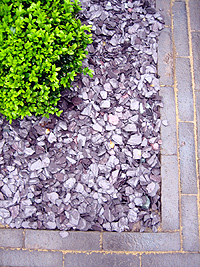 An evergreen Parterre was planted using Buxes (box). It was planted in a diamond shape rather than a square and Buxes balls were also planted outside of it. A Witch Hazel was chosen to provide a splash of colour in the winter months. 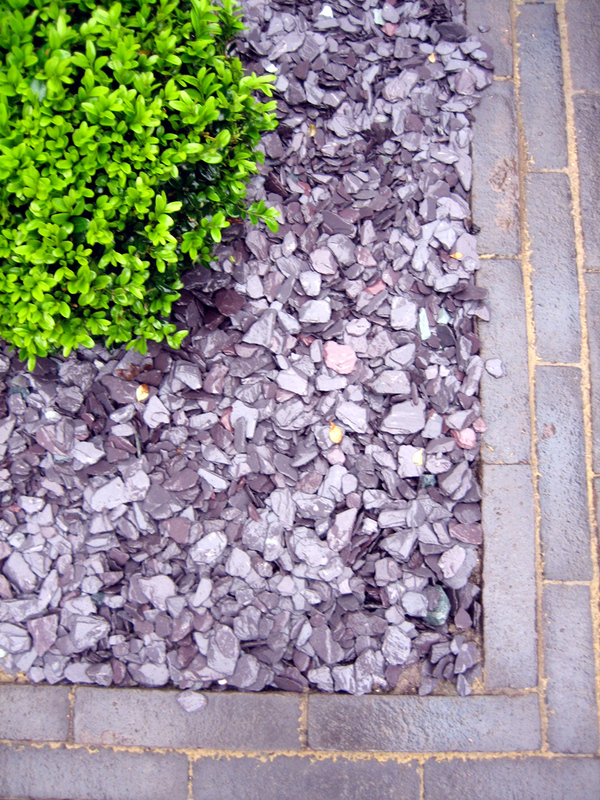 The ground between the paths and the parterre was mulched with slate shingle. However the soil inside the parterre was left to allow bedding to be planted seasonally.